Ever after you submit your primary application, the work isn’t over. Secondary essays are still a huge part of your medical school application. On this podcast, I’ve covered a lot of different topics related to the application process, including personal statements, applications in general, and interview prep. But I’ve never actually talked specifically about writing your secondaries until now, so I want to touch on this topic today. 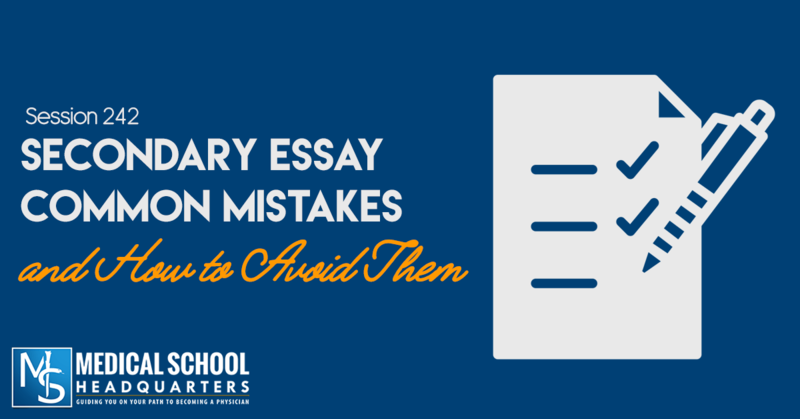 Specifically, we’ll discuss the most common mistakes students make when it comes to secondary essays. One of the biggest mistakes students make is waiting for the request for secondary essays to come before they start working on them. If you’ve submitted your primary application and you’re not writing your secondary essays, then you’re behind. Some schools will monitor how long it takes you to send a secondary back and they will use this as a gauge on your interest to get into their school. If it takes you three weeks to respond, while their average response time is a week and a half, chances are that you could be put lower down the list. Remember that the medical school admissions process is a rolling admissions process, which means that as soon as applications open, the clock is ticking. This is different than applying to college, which is a deadline-driven process. As long as your application is in by the deadline, you’re just as good as everybody else that applied. This is not the same with medical schools. So the earlier you turn in your primary application and the sooner you’re done with your secondary essays, the sooner your MCAT score is in, the sooner your letters of recommendation are in, and the sooner your application is complete, you have a better chance that the schools will look at your application while they still have plenty of interview spots open. Applying to medical school is like a game of musical chairs. Your chances of getting a seat becomes slimmer as the application cycle goes on… As you get later in the cycle, there’s a decreasing number of seats available and an increasing number of applicants in the pool. This is why you need to apply early and understand how putting off the MCAT can affect you. If you’re asking how to pre-write your essays when the schools haven’t sent them to you yet, the good news is most schools don’t change their essays from year to year. There are a few exceptions, but most schools don’t. We have compiled a Medical School Secondary Essay Database, with prompts from all the medical schools. Look up the schools you’re applying to, and if your primary application is submitted, get started on your secondaries. You will find that writing secondary essays gets easier and easier over time because a lot of them are around the same theme. The second biggest mistake students make with secondaries is letting them sit on your desk or unopened in the mailbox. Let’s say you scheduled a vacation in the middle of application season for some reason, and your secondaries are just sitting there for a couple of weeks while you’re traveling. You can’t do this. You will find out that a lot of the questions are very similar from school to school. A lot of them are going to ask about diversity or why you’re applying to a DO school, so you need to be prepared to answer these. Some students will try to write answers for broad types of questions, like write a generic answer for “diversity questions” or “what will I bring to the class” type questions. Don’t try to answer question batches like that. Just answer the secondary prompts from one school, then move on to the next school. Don’t try to work outside of a school framework. One common feedback I give to students I work with is that they’re not answering the question. They told a beautiful narrative about this patient they saved, but they didn’t answer the question the school was looking for. You have to answer the questions. Most of the questions are asking you something very specific, so keep that in mind and make sure you’re answering the question. I recommend you get feedback from somebody. Ask them to review whether or not you’re answering the question asked. A common question for secondary essays is, “What about our school makes you want to go here?” A lot of students can get so generic here that I can just copy and paste it from secondary to secondary for every school that asks the same question. You need to say something specific about the school. You need to do some research and come up with a list of programs at each of the medical schools, or student organizations at each of the medical schools. If you want to join a specific program at that school because of the impact you see it having, talk about that. Mention the program by name. Mention very specific types of things or types of research. Mention the mission statement of the school or the program. Do your research. A lot of medical schools may look alike after a while, but do your research and see if there’s anything specific that you can draw out to help you write your secondaries. Students tend to repeat the same stories from their primary application on their secondary. Don’t tell the same story. Even if they’re asking for your most meaningful clinical experience, you can talk about the same experience, but don’t tell the same story. Some essays will specifically tell you not to repeat anything that’s in your primary application. If that is the case, then you can’t even talk about the same experience. You have to figure something else out. It can be frustrating when schools do that, especially when they ask about your most meaningful clinical experience and you already put that in your personal statement. Some schools will ask for a list of extracurricular activities. In that case, it is okay to just copy and paste from the list you created for your primary application. You don’t need to re-work everything and re-frame things and tell new stories. Just copy and paste it. Some schools just want it in their secondary and not in the primary application. Be sure to edit it and have somebody look over your stuff. Copy and paste all you want, but then put it aside for the day, and go back and check the next day. Make sure all of the names have been changed and everything is up to date before you send it off. Check out our Medical School Secondary Application Essay Database. Check out our Secondary Essay Editing service. Related episode: Does It Matter How Fast I Turn Around My Secondary Essays? Related episode: What Does the Med School Application Timeline Look Like? ← How Can I Score Higher on my MCAT Retake?